The agocontrol security system is implemented in the "agosecurity" component. It provides a "securitycontroller" device to the system. This is used to interface with the security system, like changing the house mode, cancelling an alarm and triggering zones. There is no fixed assignment of sensors into zones, like in other systems. 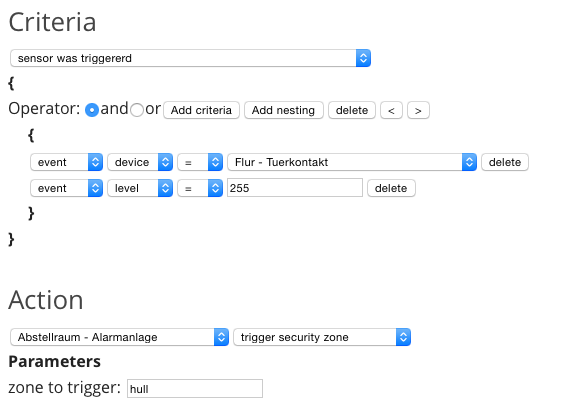 In agocontrol you trigger a zone by sending the command "triggerzone" to the securitycontroller device. It takes a "zone" parameter. Usually this command is sent from an action in an event handler. This gives endless possibilities, as you can use arbitrary criteria in your events. Different housemodes define the state of zones. A zone can be either "inactive", or be set to a specific delay value in seconds per housemode. In this example we use three housemodes: "armed", "armed_athome" and "disarmed". "armed_athome" shall trigger instant alarm for the "hull" zone (which will be triggered by a door sensor), but not react upon triggers in the zone "inside", as we don't want the movement detector in the foyer to trigger an alarm when we're at home. When being away, housemode is set to "armed'. The delay will allow us to disarm the system before the alarm sets off when coming home. This page was last modified on 6 March 2016, at 20:31.